This concert didn’t have a swanky title. But (either because of these upcoming TSO concerts or not, I can’t recall) I’ve recently been a bit more curious about Enescu, Martinu, and others. One of the defining characteristics, I feel, of many of the Taipei Symphony’s concerts is the unique programming. 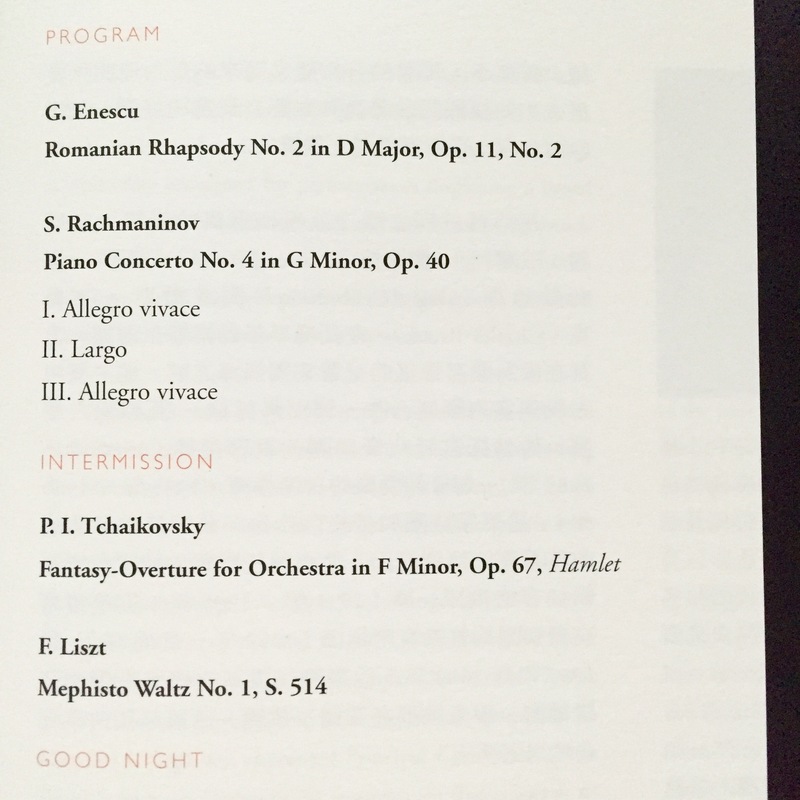 That’s not to say everything is a premiere or that the above works on the program are from never-before-heard composers, but I’m very glad not to be getting another Dvorak 9 or Grieg piano concerto every other week or something. They did do a concert earlier this year with Reich, Ligeti, and more cool stuff on the program. In any case, Enescu’s Romanian Rhapsody is famous (to a fault, the composer felt), the two rhapsodies being perhaps his most famous works, and one can see why from the get-go. One feels the kind of nationalistic, nation-representing, down-to-earth sound one feels when listening to like, Copland’s Appalachian Spring or something, but in Southeastern Europe instead of the Eastern U.S., Romania, not Raleigh. It’s instantly approachable, richly melodic, pleasant to the ear, and while this article is about the concert rather than the pieces (the TSO played it sumptuously and shimmeringly, especially with the little viola-led band toward the end), the piece feels like one without much ‘staying power,’ a piece that shows all its tricks up front, survives on its beauty. At least that was my impression, but it was a good enough impression for the beginning of a concert, and Varga seemed either to create or ride the swells in the orchestra, a sound that is unmistakably exotic and interesting to my ears. Next on the program is Rach 4, the more obscure, neglected of the four (five, if you include the hugely crowd-pleasing Paganini Variations), perhaps even less-performed than the very young first concerto. The first symphony was a real work of youth and vigor, but I’m not so sure about the merits of the first concerto. In any case, as Varga told us in his ever-present introductory lecture, the pianist would not be sitting with the piano adjacent to the audience, but rather facing us. I’d have loved to get a picture of the setup. The piano literally did point right out at the audience, with the pianist at the conductor’s 2’oclock, the podium almost nestled into the curve of the piano, lid removed. I was very curious as to why. I asked a regular concertgoer if she’d ever seen this sort of thing and she suggested it was because the stage was too small; I assured her I’d seen many normal layouts before. No idea. In any case, one sees why the Rachmaninoff has not seen the success of its two younger siblings. It doesn’t have the long, lyrical opulent lines magnificent melodies that take away the collective breath of an audience. Rather, it’s a bit… chattery. One can hear Rachmaninoff in the work, but it comes off in many ways, to me, as troubled or anxious. There are some (dark, Russian) swathes of what I suppose people are referring to when they talk about the jazz elements in the work, but to me, it comes across more as bluesy, since the jazz elements I hear are in harmonies rather than bouncy catchy rhythms and tunes. Again, not about the work, and the bearish Berezovsky, to all I could tell, performed the life out of the piece. Facing the audience was an interesting setup, and we get to see on YouTube the interesting facial expressions and mouthings that pianists make when they’re ‘in the zone,’ but they can sometimes be disconcerting, as if a pianist is struggling or suffering. Berezovsky seemed to pull the whole thing off without much difficulty; the piece seemed to ‘come home’ a little bit, as if Rachmaninoff was falling back on old ways in the second movement, finally giving us a big fat piano-and-orchestra theme. Perhaps one of the biggest challenges of this work (aside from technical stuff) could be reconciling what this piece is (at least for me). Written a few years before Ravel’s G major concerto and not long after Gershwin’s Rhapsody, while in America, after Rachmaninoff had been studying Scriabin’s work, it seems there are disparate elements that are fighting for attention here, and I’d definitely need to give it a few more listens before it makes sense, but it was a treat to hear live. Tchaikovsky’s Hamlet came after the break, and I’d say it was the highlight of the evening. It’s a language and expression that the audience and performers are familiar with, the dripping, gushing, Russian Romanticism of Shakespeare-inspired Tchaikovsky, and they played every one of the fortes in Pete’s fffff markings, as well as every piano in his ppp. It was extremely well executed, and fully satisfying in multiple areas. Talk about contrasts. The clarity and almighty roar of the low brass underpinned much of the work, and the cleanness of attacks and stops were pristine and biting, contrasting with delicate things like the weeping oboe solo. Spectacular. Finally, we had Liszt’s first Mephisto Waltz, and while I must say I prefer the piano version over the orchestral one, the difficulty of the string work, the density of sounds and notes and attacks is impressive, and it carries an altogether new ominousness when played by a full orchestra with big brass and low, rumbling strings. The piano version sounds far more innocuous and celebratory, while the orchestra brought us roars and howls, and one convincingly saw and heard selling of souls and all the rest. Overall an enjoyable night, but I must say my head was probably elsewhere for part of the evening. May has been a big month for concerts, and I’m coming off a sinus infection. There are still four more concerts this month, though, which I’m okay with, since things will be winding down as summer approaches. That’s all for now.